If you look up any list of top internet sensations most lists would include something called Angry Video Game Nerd on them. The online series has been running for ten years and features the title Nerd character (creator and performer James D. Rolfe) who plays old video games that are considered terrible. The appeal of the series is that not only are the Nerd's antics funny in their own right, but the show actually doubles as a bit of sweet revenge for people who remembers buying these bad games and being ripped off. More than once I've watched the show with a friend, only to have to lean over and say “I'm ashamed to say that I used to own that game.” The show however is more like an extended skit show at times, and as “Saturday Night Live” has learned multiple times, that doesn't always translate to screen. Therefor the existence of “Angry Video Game Nerd: The Movie” should be a product that is lousy, self-indulgent, and way too long for its own good. Can one really make a two hour review a movie? I'm not convinced Siskel & Ebert could pull that off. Thankfully Rolfe (also with co-director Kevin Finn) apparently spent years working on the screen play and exploring all the ways they could to bring the character to the big screen. What they ended up with is not a two hour game review, but rather a movie about reviewing games. One that happens to have aliens, monsters, and (most unrealistic of all) a cute female love interest who is a gamer herself. This makes the movie beyond silly at times. Then again, I'm pretty sure that's the point. The story revolves around the fact that the Nerd's most requested game review is “E.T.” for the Atari 2600 (spelled “Eee Tee” to avoid copyright infringement). The Nerd was so traumatized by that game as a child that he would rather quit reviewing games altogether than spend a minute reviewing it. Still, the demand is strong, and it remains strong thanks to the legend that the game was so bad that it bankrupted Atari and they buried more than two million unsold cartridges in New Mexico. The Nerd makes a deal: If they go to the landfill and dig up the games he'll review E.T. (this site, I want to mention, is not worried about copyright infringement). This leads to a bunch –and I do mean a BUNCH – of really weird stuff that happens! The movie gets so weird even the characters seem to question what is really going on at one point. For every twist the movie throws at us you'd think the film would get wildly stupid…and it kind of does. The story goes in places that are illogical at best, the dialog can be cheesy (one scene has one of the characters telling the Nerd that what he said was he stupidest thing he's ever heard, to which the Nerd replies “Yeah, but I only said it for the trailer”), and the special effects are obviously fake looking. To my eyes the movie itself looks like a poorly made video game at points, but maybe I'm thinking too much. One thing I can say that as cheap as the movie looks at times there is a charm to the look that reminds me of those old movies by Ray Harryhausen. They may have looked fake, but they felt real in some strange way. I feel that before I end the review I need to elaborate on my score. I want to mention once more that the star grade is suggestive and not absolute. I'm giving “Angry Video Game Nerd: The Movie” a high score not because it's a score I would stack up next to “Guardians of the Galaxy” and “Teenage Mutant Ninja Turtles,” but because this is the type of movie from original sources that movies should aim to be like. They've turned a few internet shows into movies before. For the most part I would say that these are not very good and I don't typically like shows that are turned into movies. 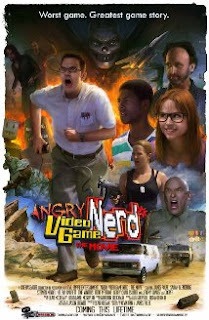 “Angry Video Game Nerd: The Movie” is the best movie I've seen come from a viral hit, which in itself is a small miracle. Yes, it's uneven at times. In fact I would argue that there is probably some fifteen minutes of footage in here that could be cut from the film that would result in better pacing. I suspect that the people who see this movie won't have the problems most people who watch movies would have though. It lives in its own little bubble, mining comedy from the most unlikely of sources and fully embracing the silliness of the whole affair. Rolfe may not be the most versatile actor I've seen but it's clear that he has created a memorable character and has mastered facial expressions for great comedic effect. Sadly, despite the film being in widescreen it will only be shown on a few screens before going straight to DVD. The movie, like all movies, is better experienced on the big screen, and if you have the chance to do that I would take the opportunity. Parents, there is strong language as well as some crude humor. Recommended for ages 17 and up.